Joshua Jacobson's masterpiece -- the comprehensive 1000-page guide to cantillation -- is also available in a condensed, 300-page, user-friendly paperback edition. It is an ideal instructional guide for adult and young-adult students of Torah, for b'nai mitzvah students; and for cantors, rabbis, and Jewish educators of all denominations. Like the original edition, it includes an explanation of the tradition and a description of the practice of chanting, with all its regional variations and grammatical rules. There is detailed instruction, with musical notation, on chanting of Torah, and shorter instructions for chanting the haftarah, the megillot, and readings for the High Holy Days. Over 85 links to the audio CD throughout make it easy for readers to follow examples in sound as well as in print and is invaluable for those who cannot read music. Charts, helpful hints, pronunciation guide, glossary, and indexes to the book and the CD complete the book. Joshua Jacobson, professor of music and conductor of the acclaimed Boston-based Zamir Chorale, has been Torah chanting since he was 10 years old. 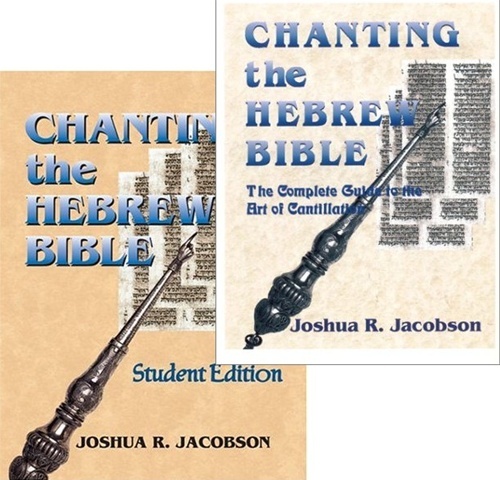 That life-long experience, combined with the an unquenchable desire to reconnect the art of cantillation with the most convincing and accurate treatment of the ancient text possible, led him to create this indispensable teaching tool. Using Jacobson's highly acclaimed approach, the ancient words come alive in a new, deeply emotional and most accurate way.